Our second pop-up restaurant event in the Blink series will take place in Louise McKinney Park on August 26, 2012. Kara and Nevin Fenske of Drift Food Truck have designed the perfect menu for an urban picnic in the park with a four course family-style dinner with their spin on familiar comfort foods. 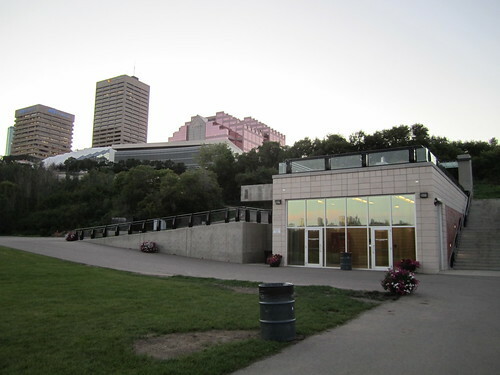 The evening will begin with an “escalator cocktail” from the Shaw Conference Centre, and end with coffee or tea from the River Valley Adventure Co. Also included in the ticket price is a complimentary Segway ride following dinner. Tickets for this pop-up restaurant are $50. Cocktails from 5-5:30, dinner from 5:30-7:30pm. Seating will be at a communal table. Tickets will go on sale at 9 a.m. on Monday, August 20, 2012 at YEGLive. Coffee or tea from River Valley Adventure Co. Please note: we cannot accommodate substitutions or special requests. Blink: Urban Picnic will take place in Louise McKinney Park, atop River Valley Adventure Co. at 9735 Grierson Hill. Kara and Nevin Fenske have been operating Drift Food Truck in Edmonton since July 2011, serving up globally-inspired sandwiches influenced by their travels around the world. In that time, they have developed a loyal following, earning them a profile on the popular Food Network program Eat St. They are proud supporters of local producers and independent businesses and showcase homegrown products whenever possible. Follow them on Twitter to find out where they’ll be next! Mack Male and Sharon Yeo are passionate Edmontonians who live, work and play downtown. They are the organizers of the successful food truck festival called What the Truck? !, created in an effort to marry their love of food with a vision for a more vibrant city core. Inspired by the pop-up nature of Diner en Blanc, Blink hopes to capture the possibility of underutilized spaces downtown all while creating a sense of community.